Elegant restaurants along the Bosphorus prepare fish beautifully and plainly, in a Mediterranean style similar to that of Italy or Greece. In Beyoglu, Istanbul’s nightlife hub, tables are cluttered with tavern food in tapas-like portions. It’s all delicious, of course—and a little familiar. But when you encounter a delicate rice pilaf flavored with clarified butter, or a perfect slice of baklava, the dozens of pastry layers dissolving one by one on the tongue, it’s a reminder that Istanbul is home to another cuisine, one as complicated and sophisticated as contemporary Turkish food is simple and sustaining. The cuisine of the Ottomans, whose empire once stretched from Baghdad to Budapest, was perfected in Istanbul in the 15th and 16th centuries in the kitchens of Topkapi Palace, home of the sultans for 400 years. Ottoman control of the spice trade was at its peak, and the cuisine’s hallmark is its deft mixing of sweet and savory flavors. Today, dishes such as delicately stuffed Black Sea mackerel and sea bass flavored with mastic, an aromatic resin usually reserved for desserts, are appearing on menus at some of the best restaurants. A chef in the classical Ottoman period might have devoted his whole working life to one dish; modern-day chefs have special training and often base their interpretations on archival research. 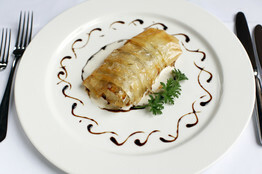 The cuisine’s revival comes as many people in Istanbul are becoming more interested in their Ottoman heritage. 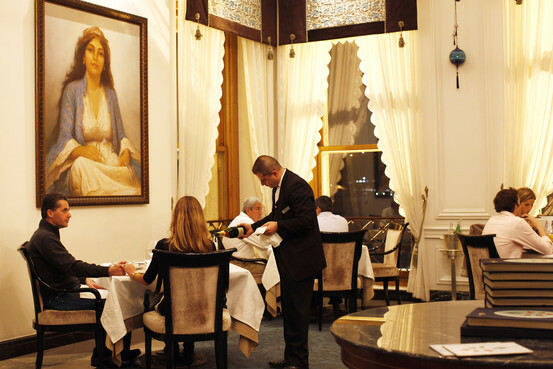 The flowering of Ottoman restaurants is among the most visible results. For example, modern Turkish kebabs are usually composed of lamb pieces roasted on a metal skewer. Traditional Ottoman kebabs could have been lamb, rabbit, duck or pigeon, often skewered on flavor-enhancing eggplant stalks. Karakol serves duck-breast kebabs with an almond-humus foam, recalling tarator, a traditional Ottoman sauce of ground nuts and lemon. 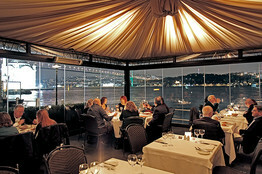 At Mr. Basaran’s Feriye Lokantasi restaurant, set right on the Bosphorus, skewers are rosemary stems. Mr. Basaran anticipated the Ottoman revival back in the 1990s when he opened Tugra, a groundbreaking Ottoman-style restaurant in the opulent Ciragan Palace Kempinski hotel overlooking the Bosphorus. One of his most celebrated rediscoveries was the addition of dried cherries to stuffed grape leaves, giving the dish a lush, unexpected tartness. Some traditional aspects can’t be authentically replicated, Mr. Basaran notes. The “perfume” of Ottoman dishes often came from rare ingredients like deer musk and ambergris, an aromatic whale secretion. Priscilla Mary Isin, an English-born translator and food historian who has lived in Turkey since the 1970s, says Ottoman cuisine in its heyday reflected a society that was officially Muslim yet encompassed a range of religions and ethnicities. The empire’s governors returned to the palace with recipes from provinces on three continents. “That’s why the cuisine is so marvelous,” Ms. Isin says. “It’s a big synthesis.” It was also “a fine cuisine of the elite,” who could afford an endless supply of manpower, she notes. A telling illustration of the difference between Turkish and Ottoman cuisine, she says, is in a dish found in both, which she calls “eggs with onions.” “It’s a very simple dish,” Ms. Isin says. “You fry your onions for awhile, plop in a few eggs, cook it and then you eat it with bread. What did astonish visitors was the display of material wealth. Ottoman textiles were sable-lined and brocaded with precious metals. Food was served on Chinese porcelain specially created for the sultan. The main courtyard was the setting for lavish banquets, with thousands of guests dining on dozens of courses that were extravagant even by the standards of western European royalty. Europe’s palace kitchens often were hidden, but the Ottomans’ master architect, Mimar Sinan, made the Topkapi kitchens some of the palace’s most conspicuous structures. Viewed from the Bosphorus, the kitchens’ 20 chimneys are like European cathedral spires. Banquets were held in the vast loggia of the second courtyard—in effect, the empire’s administrative center— but meals also were served in resplendent interiors, such as the imperial hall of the harem, decorated with imported Dutch tiles and Venetian glass, or the intimate “fruit room” lined with elaborately decorated panels. In 2010, Istanbul will be one of Europe’s “Capitals of Culture,” along with Pecs, Hungary, and Essen, Germany. The year will be marked by infrastructure projects and cultural events, including the Topkapi kitchens’ reopening in late 2010, Mr. Ortayli says. Before they were damaged in a 1999 earthquake, the kitchens displayed cooking equipment as well as a selection of Chinese porcelain. In the new exhibition space, more of the palace’s porcelain collection will be placed on permanent view. Food at Topkapi wasn’t just something to eat, says Gülru Necipoglu, Harvard’s Aga Khan Professor of Islamic Art and Architecture. It had political significance, representing the “generosity of the dynasty.”When the Janissaries, the sultan’s standing army, rebelled, they would turn over food cauldrons to show their disrespect, she says. Ottoman cuisine’s popularity is a sign of “neo-Ottomanism,” she says, a “nostalgia” for the empire’s cosmopolitan past. It’s a reversal from the early decades of the Turkish Republic, when the government aggressively tried to erase evidence of the Ottoman Empire from public life. Wearing of the fez, which had been part of the empire’s national costume, was outlawed, and the Roman alphabet replaced the Ottoman version of Arabic script. “Everything Ottoman was considered horrible,” Ms. Isin says. The republic’s active rejection of Ottoman culture could be felt as recently as the 1990s, she says. Few hotel openings have been as eagerly awaited as the reopening of the Pera Palace hotel, set for spring 2010. It first opened in 1892 as a hostel for travelers on the Orient Express. The two-year, €20 million ($29 million) restoration will leave many belle époque furnishings intact, including a wood-cabin elevator. Suite 101 is a museum honoring Kemal Ataturk, father of the Turkish Republic who strategized there in the last days of the Ottoman Empire (www.perapalas.com). Istanbul residents shop north of the Golden Horn in Beyoglu and along the Bosphorus, but most of the tourist sites are to the south, in Sultanahmet. Along a hotel-lined street beneath Topkapi Palace and the Blue Mosque, a midpriced standout is the Darussaade Hotel, in a pastel-painted 19th-century wood mansion; rooms are furnished in a late-Ottoman style (www.darussaade.com; double rooms range from $120 to $168). The Archaeology Museum, tucked in a remote corner of the Topkapi Palace grounds, is widely considered one of the best of its kind, rich in antiquities unearthed throughout the Middle East (nearly all of which was at some point under Ottoman control). The collection’s signature work is the Alexander Sarcophagus, from the 4th century B.C., with marble carvings depicting scenes from the life of Alexander the Great (www.kultur.gov.tr). Five centuries after its mosque-building spree, Istanbul can’t stop building shopping malls. They are springing up, one after another, in the new districts on the European side. Kanyon, opened in 2006, isn’t the largest, but it is certainly the most visually arresting, with swirling architectural elements creating a canyon of open space. Walk across a gangplank into an adjoining sphere to catch a movie (www.kanyon.com.tr). Amiable brief and this enter helped me alot in my college assignement. Say thank you you as your information.